If you haven’t yet noticed a trend, in addition to supplementary skincare, this year a big focus for Maddy Loves is also natural skincare. 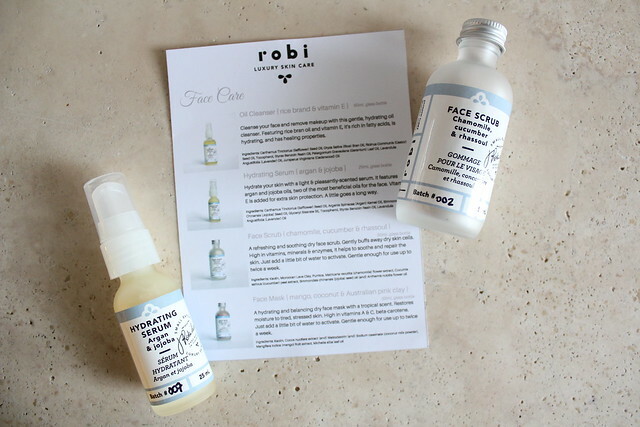 I was recently introduced to Robi Luxury Skin Care, a natural skincare line born and made in Toronto, Canada. 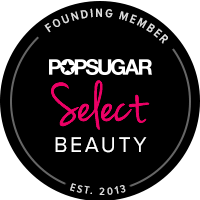 The company offers a core skincare line that is comprised of an Oil Cleanser, an oil-based Hydrating Serum, a clay-based Face Scrub, and a clay-based Face Mask. They also offer a popular 100% natural Body Butter that is available in several energizing as well as relaxing formulations. My first thought was that the artisan glass bottles are adorable and look super cute on my vanity-top. The glass bottles are also fully reusable, so you can refill it with other favourites once you’re done with your Robi products. For my face, received the Face Scrub and the Hydrating Serum from the brand. The Face Scrub (C$16 for 50mL) is a powder scrub that features kaolin, Moroccan Lava Clay and Pumice as the key ingredients. It also contains chamomile flower extract, cucumber peel extract, jojoba seed oil, and chamomile flower oil (Anthemis Nobilis Flower Oil). For a clay-based scrub, this is extremely gentle on the skin. They recommend that you mix it in a bowl, 1/2 tsp powder with 1/4 tsp water, but I’m lazy so I just mix it in the palm of my hands and it work very well. I really like this because you can customize the level of scrub – my skin is more sensitive so I might add a bit more water, but the end effect is that my skin is very well exfoliated and feels very soft. The Hydrating Serum (C$25 for 25mL) is an oil-based serum. It contains safflower seed oil, argan oil, jojoba seed oil, and lavender oil. It smells truly relaxing because of the lavender, and I particularly enjoy using this at night. I’m just slowly stepping back into the world of facial oils because a few years ago I found that they didn’t work well with my skin type. However recently I’ve rediscovered this type of skincare product and so far I’ve loved incorporating it into my skincare routine. In general though, I prefer more watery, dry-oil types, and the Hydrating Serum is definitely quite dense and a slow absorber. Instead of using this like a typical serum (underneath moisturizer), I use this as the last step of my night-time skincare routine after a water-based serum. The oils in this serum are harder to spread, but very moisturizing so it works much better as a last-step. I only need 2-3 pumps to cover my entire face and neck. 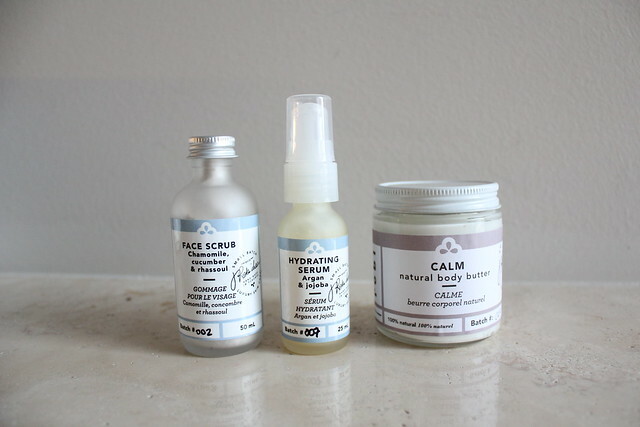 My skin has been quite dehydrated lately, so the Face Scrub and Hydrating Serum together are great to keep my skin looking hydrated and feeling plumped up. 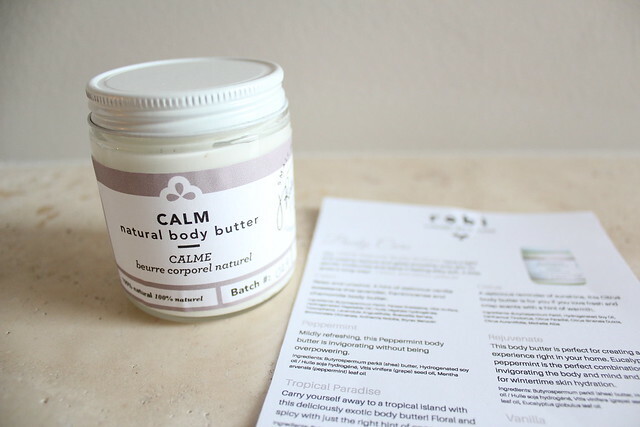 I also received the Calm Body Butter (C13 for 120mL). It contains Shea butter, avocado, grape (extract? ), as well as lavender, frankincense, and chamomile for a relaxing pre-bed experience. Despite it being such a small jar, this body butter is incredible. A tiny bit goes a loooong way! I’ve recently been obsessed with body oils, and this body butter is essentially a body oil in solid form. I normally scrap a bit of this off, warm it up between my fingers, and apply it to where I need it most. It is extremely nourishing, and leaves my skin not only feeling great, but also smelling great. The lavender, frankincense, and chamomile are very soothing for my nose and spirit, and it’s a great treat for myself after a stressful day at work. Overall I’m a fan of Robi Skin Care’s products. There are only a limited number of offerings right now, but I hope to see them expand to other products going forward. You can purchase Robi Skin Care online as well as at certain stores in the Maritimes. Canadian customers get free shipping for orders of $75+ and our U.S. neighbours can get free shipping for order over $100! I’m getting more into natural skincare too! It’s hard not to be swayed when you’re using products as lovely as these sound, especially with that body butter! The face scrub packaging is so cute!! When I read that they were natural I thought they would be kinda pricey but it’s not bad!!! Yeah the prices are definitely reasonable. I think you get smaller quantities though, but they don’t put preservatives in the products so it’s better to use small batches to ensure freshness.